As technologies shrink so too do the enclosures that supports them. Just a decade ago it would have been hard to imagine we would be walking around with handheld smart phones that have more power than a full desktop from that time. Of course smart phones don’t have the same performance as a PC, so to truly have a powerful system capable of gaming and running demanding applications you need something larger, but even high-end desktop computers are getting a miniaturization. One of the smallest cases we have seen on the market is the new Cooler Master Elite 110, which is a Mini-ITX case that is cable of supporting up to four SSDs, three mechanical hard drives, a single 8.2-inch dual slot graphics card and a full ATX power supply. In addition, the Elite 110 is capable of supporting a single wide 120mm closed loop water cooler at the front of the case. 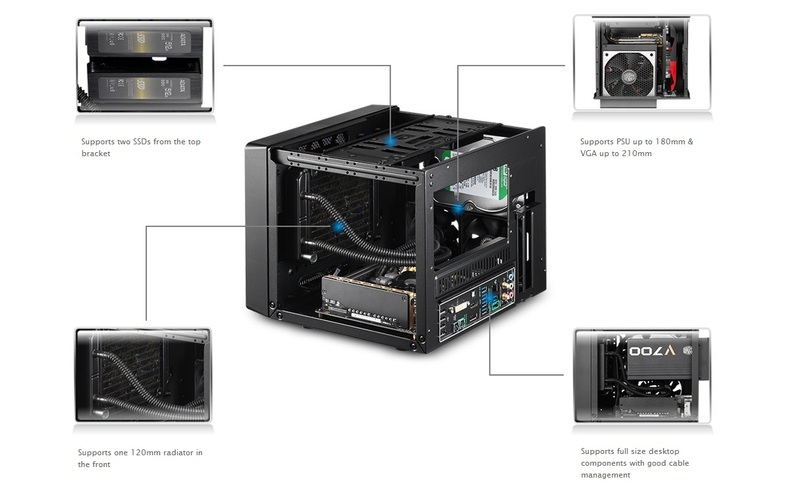 Really the only things missing from a full ATX case is the motherboard support, the ability to run dual graphics cards and the lack of spacing for 8 hard drives. Since the Cooler Master Elite 110 doesn’t have all the metal and plastic that is required to build a mid-sized tower the building cost of this unit is much lower and the cost is passed down to the end-user. A traditional tower cost anywhere from $75 and up, while the Elite 110 as an MSRP of only $50.